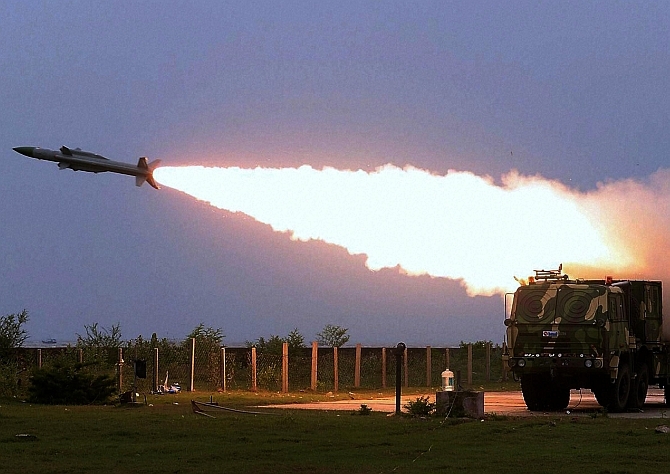 More than three decades after the project was initiated, Army on Tuesday inducted the indigenously-developed supersonic surface-to-air missile Akash, capable of targeting enemy helicopters, aircraft and UAVs from a range of 25 km. The missiles, developed by the Defence Research and Development Organisation, will be a boost for the Army Air Defence Corps, which had been grappling for years with obsolete air defence weapons. "The capability that we have with this system will ensure that it takes care of vulnerability of our assets. Akash is a step towards self-realisation of indigenisation," Army chief General Dalbir Singh Suhag said while presiding over the formal dedication ceremony in New Delhi. He added that the Army was in the process of reinventing the command and control and battlefield management system of the Army Air Defence. Akash missile system is an indigenously developed supersonic short range surface-to-air missile system with the capability to engage a wide variety of aerial threats like aircraft, helicopters and unmanned aerial vehicles up to a maximum range of 25 km and up to an altitude of 20 km. The system, which has 96 per cent indigenisation, is capable of simultaneously engaging multiple targets in all weather conditions and is capable of providing comprehensive short range missile cover to the vulnerable assets in the field force of the Army. The Akash weapon system, which will be deployed facing the western borders, employs command to line of sight guidance and relies on sophisticated radars and control systems to guide the missile to its targets. The Army has initially ordered two Akash regiments, with six firing batteries. The total cost of the order which includes hundreds of missiles is about Rs 19,500 crore, defence sources said. They said that the first full regiment should be ready by June-July and the second one by end of 2016. The Indian Air Force has already inducted its own version of the missile system. "The Army version is movable and is mounted on vehicles unlike that of the IAF. This means that it can be moved quickly based on operational needs," G Chandramouli, Project Director of Akash, told PTI. Akash is one of the five core missile systems of the integrated guided missile development programme, launched by DRDO in 1984. On the delays in the project, the Army Chief said, "The journey of Akash has not been easy. It took more than three decades for this moment to arrive. There have been numerous challenges, number of setbacks, ups and downs." But the cycle of development continued, he added. The missiles will replace the ones that were inducted in 1970s. Its weapon system has been designed and developed by DRDO. While Bharat Dynamics Limited is the lead integrator for the Army Akash Weapon System, the other major system provider are BEL, ECIL, HAL, TATA Power SED, L&T and others. Besides this, a large number of medium and small scale industries has been actively involved in this indigenous development programme, Defence officials said. Special Secretary of Defence Production in the defence ministry, Ashok Kumar, said that a number of countries like Thailand and Belarus has evinced interest in Akash. "This shows that Akash is a world-class contemporary weapon system. DRDO deserves kudos for this and also for the fact that unlike other weapon systems that they have designed and developed here, the indeginisation is very high, which is 96 per cent, and it perfectly fits in the 'Make in India' concept," he said. General Suhag said that today was the beginning of a new era for Indian army and Army Air Defence towards modernisation. "Indian economy is a power horse and India is expected to play a major role in the new world order. Rightly so, we need to be prepared to undertake any challenge that comes our way in future," he said. The chief noted that air defence has become more dynamic and challenging. "In fact air threat has gone beyond the deployment of aircraft and helicopter. Hence, we need to make sure that we have effective state of art air defence weapon system," he said. General Suhag added that modernisation of air defence system is one of the seven critical schemes that the Army has identified as part of its modernisation programme. "There are two ways through which we are addressing air defence. Firstly by upgradation of existing systems and second by way of induction of state-of-the-art weapon system. "We are also in the process of reinventing the command and control and battlefield management system of the Army Air Defence," he said.